By Plane, by Train, by Car, by Boat… Away James Goes! Wave quilt using Dear Stella!, “On My Way” fabrics. 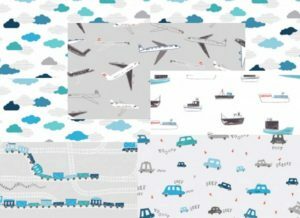 There are waves of transportation that go across the quilt: airplanes, cars & taxis, boats and his favorite of all- trains! This is the quilt that I made for James for Christmas 2016- shhh, don’t tell him! 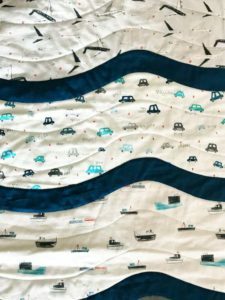 The Dear Stella!, “On My Way” fabrics were perfect for this quilt, featuring different modes of transportation: planes, cars, taxis, boats and his favorite- trains! The backing of the quilt was this very comforting cloud print. I find that binding the quilt by hand is very soothing and gives me great satisfaction that the recipient will hopefully understand the difference- maybe not at 3 years old, but some day. 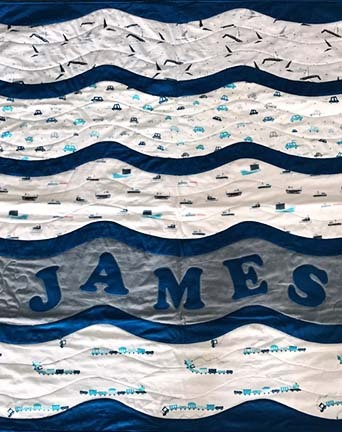 This was my first time tackling a wave quilt and making it flat in the end- as opposed to a curved mess! I quilted it using a wave pattern that kept with the mood of the quilt. Fabric Swatches of the Dear Stella!, “On My Way” collection. Previous PostCheckmateNext PostNew Discovery, OR Should I Call It a New Passion!